Thirsty Baby Flamingos Airlifted To Safety In South Africa A drought left a flamingo breeding ground dry near Kimberley, South Africa. When the adult birds left, animal lovers flew thousands of baby birds to safety. A special airlift brought these flamingo chicks from a dried out dam near Kimberley to a center in Pretoria, Thursday. Thousands of baby flamingos are recuperating in sites across South Africa after bird lovers helped rescue them from a breeding ground run dry. The species known as Lesser Flamingos breed in Kamfers Dam in central South Africa, said Katta Ludynia, research manager at the South African Foundation for the Conservation of Coastal Birds (SANCCOB). She told NPR a drought has reduced the rainfall flowing to the dam, and a sewage treatment plant is not generating the amount of potable water needed to fill the reservoir behind the dam. "The birds started to breed, and had eggs and chicks, and the water level started to decrease and they started to abandon these chicks and eggs," she said. Hot temperatures are baking the earth at the dam and according to the Associated Press, the bodies of dead flamingo chicks can be seen at the site. Mike Bolhuis said he heard about the problem on Jan. 24. He's a bird lover and private investigator and he told NPR he helped organize an airlift of 900 birds to Pretoria, 325 miles away from the dam, where he is housing them on his farm. Bolhuis told NPR he was exhausted from working to save the chicks. "I decided to take drastic and immediate steps," he said. "We went in, removed the birds, and got them to safety." 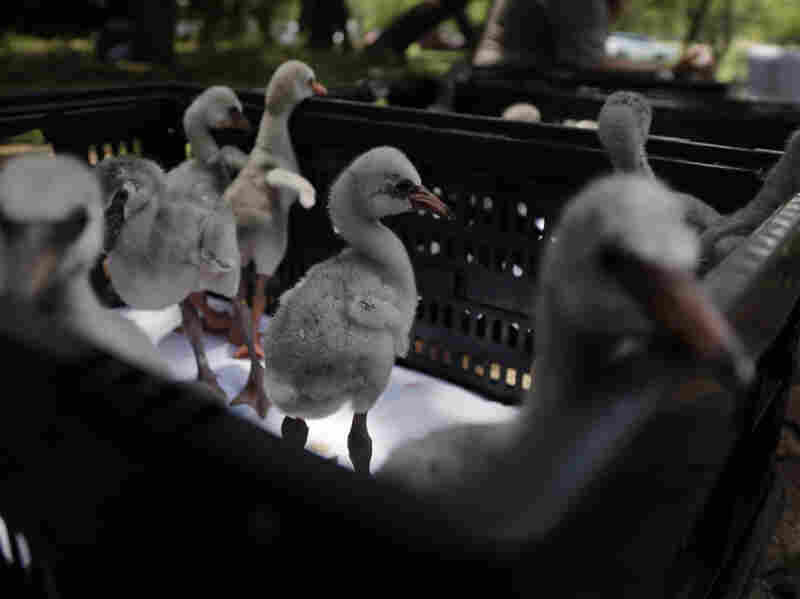 Bolhuis posted pictures online of a white pickup truck transporting hundreds of fluffy grey birds with knobby orange legs, which he described as "PROJECT: BABY LESSER FLAMINGO RESCUE." Other chicks have been sent to different sites around South Africa. Some 550 were put on a flight to Cape Town, where SANCCOB has a facility for raising baby birds, Ludynia told NPR. A third of them died within the first 24 hours. "They were literally tiny. Some had just come out of the eggs," she said. "The trip from Kimberley to Cape Town had taken several hours. A lot were quite dehydrated. " Those who survived are being fed around the clock. Ludynia said South Africans have been moved by the baby birds' plight and have donated food supplies that will last for weeks. "People have literally cleared out the supermarkets of eggs and prawns around our facility," she said. Some 40 volunteers a day help with peeling eggs, cleaning syringes, washing towels and bringing lunch, she said. The Lesser Flamingo, Phoeniconaias minor, is listed as "Near Threatened" by the International Union for the Conservation of Nature and Natural Resources. According to the IUCN, there are between 2.2 million and 3.2 million Lesser Flamingos in the world, although the trend of the population is decreasing. Some 60,000 of the birds are believed to live in South Africa and Madagascar; other locations include east Africa, India's coasts and a thin belt on Yemen's southern shore. Ludynia said Kamfers Dam is one of only six breeding grounds for the birds in the world. Namibia and Botswana both host breeding grounds in southern Africa, but the sites in those two countries are remote and impossible to control. Kamfers Dam, however, could be regulated to help the species survive, she said. South Africa has been plagued by drought in recent years. In January 2018 the city of Cape Town warned residents that "Day Zero" might arrive in which their taps would run dry, NPR has reported. City residents were told to use only 50 liters of water a day, or some 13 gallons per person, to prevent a catastrophe. By contrast, Americans use an average of 88 gallons a day per person. Water management expert Kirsty Carden at the University of Cape Town said rainfall near her city has increased over the last year, and city water restrictions have been loosened to 105 liters a day. Still, projects to develop additional water sources by drilling groundwater or purifying sewage are costly and time-intensive. "If we can't contain demand and there isn't more rain," she told NPR, "there isn't really a broad ability within cities and towns to be resilient to a drier climate that we've been dealing with." The flamingo crisis took much of South Africa's bird watching community by surprise. Ludynia said her group sprang into action after someone asked for help on Facebook. The chicks will likely spend about three to four months in the SANCCOB facility before they are released into the wild, she said. She said she hopes to coordinate that release with the other groups housing the birds, which in addition to Mike Bolhuis' effort, include another site in Cape Town, the veterinary department at the University of Pretoria and, she believes, a spot in Durban. "We're actually not sure who all is involved. It was a little bit of an unplanned activity," Ludynia admitted. "In the future there should be a better plan when evacuating 2,000 flamingos."